A few weeks ago, my wonderful aunt gave me some books belonging to my great grandmother. They were books won as prizes at school, for recognition of achievement – among them, Jane Austen’s Mansfield Park and Charlotte Bronte’s Villette. Both brilliant books. More importantly, however, they got me thinking about my own literary heritage. While The Book Habit has changed very little in terms of my reading habits and opinions, it has definitely made me reflect a little more on the process of reading as a gift. Now that education is taken for granted in most societies, it is all too easy to forget that such access was not always a guarantee (and, in many places, still is not). I am fortunate in that generations of my family have worked hard to ensure that I could be the first with the opportunity to go to university and enjoy the benefits of education well into my twenties (a perpetual student, as my parents constantly remind me). Beyond this, I have had handed down to me a passion for reading. It is not a habit that has erupted spontaneously, but one that I have inherited from those who have always emphasised the importance of literature to living a full and connected life. So, if you will allow me this one post, I would like to pay homage to a part of my personal literary heritage and thank those who have knowingly and unknowingly indulged my bibliophilic ways. Today we credit my great grandmother, Olive, and great grandfather, Leslie. Both are notorious in my family for the extensive archive of letters and books that they have left behind. Never having met them, I have had the luck of getting to know them through the volumes of love letters written to one another during the Second World War. It may not surprise you to learn that I come from a long line of overly emphatic writers and readers. But, without my great grandparents, who broke from a trend of minimal education in pursuing high quality schooling (a trend passed down through the subsequent generations), there is absolutely no way that I would be where I am today. During the Second World War, my great grandfather was sent to France as part of the Normandy Landings. The ensuing months that he spent fighting are well documented in the hundreds of letters that we have given to London’s Imperial War Museum. Having read through the letters (and actually recorded them myself as part of an online project), they are important to me as a demonstration of how important literary talents and passions are in the day-to-day. Without an appreciation for the written word, these letters would not exist and my great grandparents would have been left with limited communication during one of the most turbulent periods in history. Instead, I am able (almost 65 years after the fact) to share this with you. Because, not only did they recognise the importance of the literary in their own lives, but they set out to pass their passion down through the ages. They educated their daughters (my grandma and great aunt) and subsequently set a course for the education of my mum and myself (and my brother, although the success of this is debatable – I joke of course). 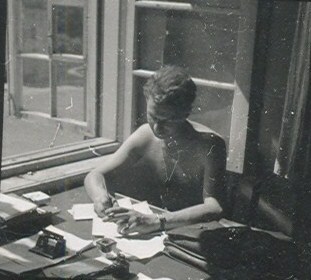 Embedded in those letters, documenting the horrors of a Europe at war, is a message that I have taken to heart and try my best to communicate through this blog – that a passion for reading and an understanding of literature’s tremendous power is by no means a guarantee. It is a product of those who have come before – who have fought for us to have access to schools and provided us with the tools to take advantage of literary education. At some point in our pasts (unless you are one of the lucky aristocratic few), this represented a break from convention and a conscious decision. While we should not necessarily become preoccupied with the past, I think we must try to recognise our personal literary heritages. For me, this is by far the best way to ensure that I do not take my ability to enjoy and indulge in literature for granted. Because, until every person has access to the necessary education, we must recognise just how lucky we are. I am the daughter of these two people, Olive and Leslie, and remember very well my own love of reading. Books then were mainly from the library or bought from shops like Woolworths, where they were cheap. There was nothing like the plethora of children's books then in the 1940s and 1950s, so it was stories like Treasure Island, Tale of Two Cities, Swallows and Amazons and, of course, Enid Blyton.It was a birthday or Christmas treat to go up to London and buy a special book as a present.As a mother, I always read a bedtime story to my two daughters and again used the local library, making a trip every Saturday morning for all our week's reading.I have a husband who reads constantly and our love of books has rubbed off on our daughters and on yet again to the next generation of grandchildren, which includes Laura (Book Habit blogger.It is a wonderful gift to have so many good books to read today and to be free to enjoy reading them. Thank you Laura for writing this article and displaying the lovely pictures of my Mum and Dad. Ah, I'm so glad you liked it! It really is awesome to have such a knowledge about them and what they wrote – particularly given that they both died before I was born. Fortunately, I have a family who are obsessive hoarders, which means we have piles and piles of letters, photos etc! Your bookcase is still one of my favourites! Laura, The bookcase has now grown to 4 of them, plus the usual extra piles randomly scattered around the house. How do we keep our books under control when it is so hard to part with just one of them? Help, we are being taken over!! !